← CA finally bans trans fat. So…what IS trans fat again?! I have the advantage of working at home most of the time, which means I can make my lunch on the fly. The downside: I often end up standing in front of the open fridge wishing I had started some rice half an hour ago when I wasn’t starving. Or that someone would swing by and make me a meal. So today I ended up whipping up one of my very favorite things: an omelette. Not just any, but an imitation of Le Pain Quotidien’s lovely, lovely parmesan pesto omelette, since I’m a lady who lunches…mostly at home. This is a fast, good, pretty low fat way of making an omelette that tastes as good or better than the kind made with plasticky drooling cheese. Wish I’d thought of taking a picture of it before the parmesan started to melt, but there you go. * One small omelette pan (if you don’t have one I recommend the 8″ open skillet most manufacturers of expensive sets use as a “try me” pan: a good one is about $20 and for eggs, go non-stick). All of the ingredients came from Trader Joe’s. The egg whites are good for at least 2 omelettes — use within the week, and the other stuff will last…a couple of months! All for about the cost of one omelette at a restaurant. Slice yourself some cheese, very thin (I use the center slicer on an old grater). Heat up the pan on low, toss in the butter/margarine (half a teaspoon will do) to coat. Pour in half a cup of egg or more when the pan is heated. Omelettes are supposed to be made on high heat, but I prefer a gentler heat and to wait so that there isn’t much “skin” formed around the omelette. If you prefer that, heat on high. After the egg turns white and starts to bubble around the edges, gently lift the sides of the forming omelette with a spatula and tilt the pan down, then up a bit, allowing the extra egg on top to flow underneath. 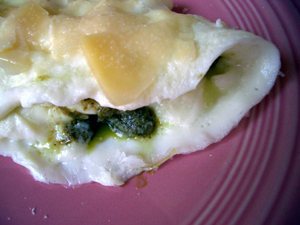 When the top looks soft but not watery, add 1/2-1 teaspoon pesto, then fold to make the omelette. Gently heat for another 30 seconds to a minute, then plate and add the cheese over the top. Makes a good dinner with very little mess. Le Pain Quotidien serves the omelette with artisan bread and a small salad of baby greens with vinaigrette, which is surprisingly perfect even in the morning. TJs sells bagged greens, vinaigrette and baguettes if you’re in the mood to go all European. And there you go. This entry was posted in food!, lunch and tagged dinner, lunch, whatever!. Bookmark the permalink. Delicious! Fridge contents now all used up – time to go shopping!